In this TV world of carefully delineated universes, crossover events are rare and special. They also –– usually –– take place between two already connected universes, like how The Flash occasionally crosses over with Arrow. When these events happen and the two worlds aren't connected, it's usually more common for a show to make it "all just a dream" or some kind of fantasy sequence rather than allowing a dramatic shift in the rules and realities of their programs. So I really have to give kudos for a show like Bones playing this all very straight. Opening up their world to Sleepy Hollow's apocalyptic escapades and allowing it to remain canonically sound takes some nerve. The Jeffersonian crew is called in when some young people stumble upon a dead body, and while investigating they find the skeletal remains of a Revolutionary War-era British Redcoat. Without a head. All of these factors have the Witnesses' Apocalypse Senses tingling, so they show up and want to hear about what's happened with the old dead guy. Thanks to technology (and not, surprisingly, Ichabod's eidetic memory) they find out that the victim is General William Howe –– previously seen on the show, shouting at Ichabod in an effort to get him to turn over information on the Patriots. Howe's body was involved in the death of the episode's actual victim –– because magic? 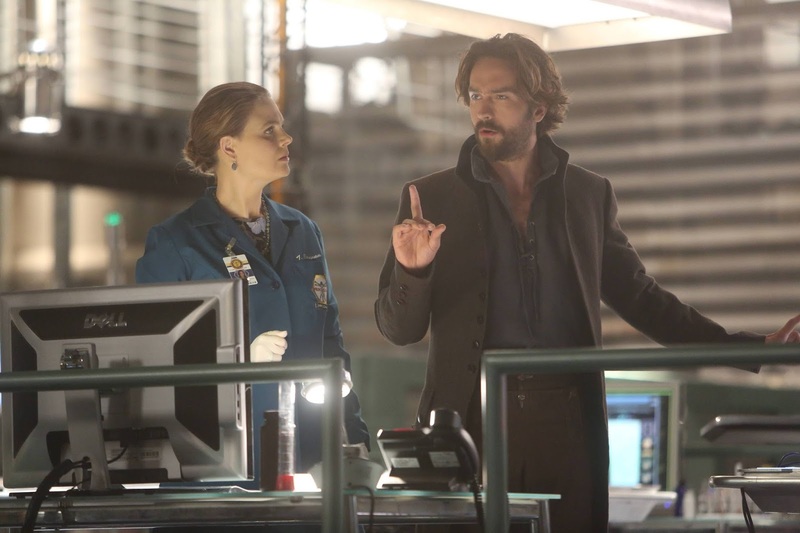 –– and Abbie decided to help them with the murder investigation so that Sleepy Hollow can get the bones of Ichabod's old enemy. Also, Agent Booth knew August Corbin? It's mentioned out of nowhere halfway through the episode. I have no idea how that works. I'm going to just assume that Corbin called up all the FBI agents in Virginia because his protégé was heading to Quantico and he wanted her to know some people. Don't really get why Booth would have remembered such a conversation, but... Yeah, crossover episode, just move on. We're not going to have a lot of depth to this review, because although the crossover was well-executed and fun, there weren't many big themes running through the thing. It plays out very much like a regular episode of Sleepy Hollow, except that Abbie and Ichabod drag Agent Booth and Dr. Brennan on their journey through occult artifacts and super secret Freemason technology. Brennan still exits the experience with her cynicism and skepticism intact, and also with an urge to tear up historically important locations just to see how they work. I'm not an expert on anthropology as a profession at all, but is it really just okay to go around saying: "Oh, this is really cool! Let's break it." all the time? That doesn't seem like a very good mentality when dealing with priceless artifacts. Ichabod and Abbie secured General Howe's body thanks to a letter Ichabod found at the Jeffersonian... that he wrote, in the 18th century, but no one really needs to know about that. Dr. Brennan had the bones delivered to Sleepy Hollow, but the delivery truck was intercepted by none other than Pandora, who raised General Howe from the dead and ordered him to do her bidding, as is her wont. General Howe was more than willing to acquiesce, since he really, really doesn't like Ichabod. General Howe has been raised as a draugr, which people who play Skyrim might know as those zombie things that sneak up on you when you're trying to explore spooky crypts. Ichabod just knows them as nocturnal, unstoppable undead warriors, and that Howe maybe turned himself into one by making a promise back when he was alive. Abbie figures out that Pandora's plan for pandemonium will likely involve a lot of undead warriors attacking Sleepy Hollow trick-or-treaters on Halloween night and Team Witness starts... you know, making sure that doesn't happen. With the help of Booth and Brennan, Ichabod and Abbie uncover the weakness of the draugr creatures (Greek fire) and, in the end, General Howe steps into the flames himself rather than be defeated by Crane directly. That works, too. Outside of the Pandora plot with the draugr, there was an important development for each of the Witnesses. The first was for Ichabod, who was struggling with the idea of asking Zoe Corinth out on a date. It was mostly about his desire to put the memories of Katrina behind him and move forward with his life, while still acknowledging the important role his wife played in making him the man he turned out to be. 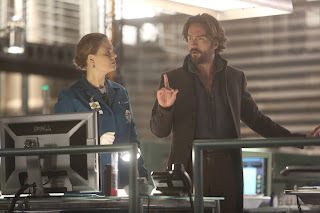 Throughout the episode, Abbie is urging Ichabod to just go for it with Zoe, and he actually does. Clearly neither one of the Witnesses have thought this plan through because, really? Ichabod dating a woman he's going to have to lie to, constantly? Yeah, that's a fantastic plan. Not going to end badly at all. The other development was tangentially related to the Adventures of Jenny and Joe happening in this week's episode. The affairs of the J-Duo (can we call them that? I'll try it out once and see where it goes) are still connected to the Anubis Shard that has been popping up throughout the season. It's revealed that Atticus Nevins –– the person who ordered the Shard stolen in the first place –– was friends with August Corbin, and both Joe and Jenny wonder if they ever really knew the man at all... Jenny and Joe confront that woman they found –– the one who seemed like she'd been trained by Corbin –– and, in a moment of desperate need to know what other secrets his dad had been keeping from him, Joe Corbin makes a deal to trade the Shard for information on how Nevins knew his dad. It's not a deal Jenny is happy about. But how does it tie back to Abbie? Well, Agent Reynolds has pictures of Abbie's sister talking with a known associate of Atticus Nevins, a black market dealer and all-around bad dude. And Abbie needs to explain herself. All in all, this was a pretty entertaining crossover event. I'm sure a lot of people fretted over the idea of bringing the supernatural into the world of Bones, but –– like I've said multiple times on Twitter –– the show had already established that ghosts exist and psychics are real, so going one step beyond that isn't really pushing it. As for Sleepy Hollow's part in it all: nothing has changed. The idea that Agent Booth knew Sheriff Corbin is interesting (if slightly confusing) but I'm sure Corbin knew a lot of people. A lot of possibly dangerous people, judging by the new information brought up at the end of this episode. Next week, things go back to normal and we might find out more about the mysterious life of August Corbin. A pumpkin falls into the headless corpse's coffin. You know, where the head was supposed to be. Because Headless Horseman. How is it that the show about murder seems to take things less seriously than the one about magical incantations and purgatory? Once again, someone calls Sleepy Hollow a "small town" and once again, I have to mention that it has a population of 144,000 people. NOT SMALL. Ichabod seems even weirder outside of Sleepy Hollow. How did he survive without Abbie when he goes around waving his finger at people and diving into thousand-yard stares at odd moments? Everyone at the Jeffersonian ships Abbie and Ichabod. For good reason. The text that shows up on the book from the computer graphic candle was... so bad. It just goes to show that the spookiness of Sleepy Hollow does not transfer perfectly to brightly lit, high-tech atmosphere of Bones. Things Ichabod has done off-screen: Watched Star Trek; read Sherlock Holmes. The bar that the Bones people go to is called "Founding Fathers"?! Abbie as Beyonce! Jenny as a Canadian Mountie! Wonderful! Joe gets no credit for his costume of dirty scrubs, though. He works as an EMT, so that's basically cheating. And finally, Ichabod is John Adams? Why, Ichabod? I have it on good musical authority that Adams was very unlikable. Is the show trying to parallel Betsy Ross and Zoe Corinth? Why? Please go back and watch the moment where Ichabod starts in on the sacredness of Ye Olde Halloween. Jenny does a full-body eye-roll and it's glorious. We get more of Ichabod and Betsy this episode, and even some Ichabod and Katrina. Ichabod confirms that he was married to Katrina for six years, but I am still so confused by the whole timeline and I think the writers probably are, too. "I'm sorry if it cuts into time with your roommate." That wasn't very smooth, Daniel. I'm demoting you from Agent Suave until you're back up to your usual standards. I'm loving the relationship between Jenny and Joe more and more each episode. They're a perfect mix of friendly and flirty and functional. "Faith results from our fear of death, art from our ability to discern an attractive mate, and love from our need to procreate." Dr. Brennan, I bet you're fun at parties. "I've dreamt about this for years. I don't want to mess up my shot." Abbie is young, scrappy, and hungry. "I have a bad feeling about this." Second time this season Ichabod's uttered a TV/movie cliche. We better learn that he and Abbie had a movie marathon weekend at some point. "Do you understand what this means?" "I don't know –– George Washington was a complete badass?" He was, actually. It's on record that he found the sound of bullets whistling past his head "charming." Nicole Beharie can shoot guns without blinking and it's THE GREATEST THING EVER. "Love is what the victors bring." I am very curious about Pandora's foreboding tree poetry.